It is important that the correct size cable is used: wrong wires into the IDC connector can distort the connections causing them to short to each to other. Use an ohm mete buzzer to check for end to end continuity and that there are no shorts between adjacent pins. Most problems are then down to wrong wiring. However occasionally we see a case where there is a bad connection in the power wiring, specifically in one or other battery —ve connection. The diagram shows a bad connection in the master battery negative earth but the same thing will apply to a bad earth in the slave. As current cannot now so easily flow from the Master’s B- connection to battery negative it will try to find alternative paths. 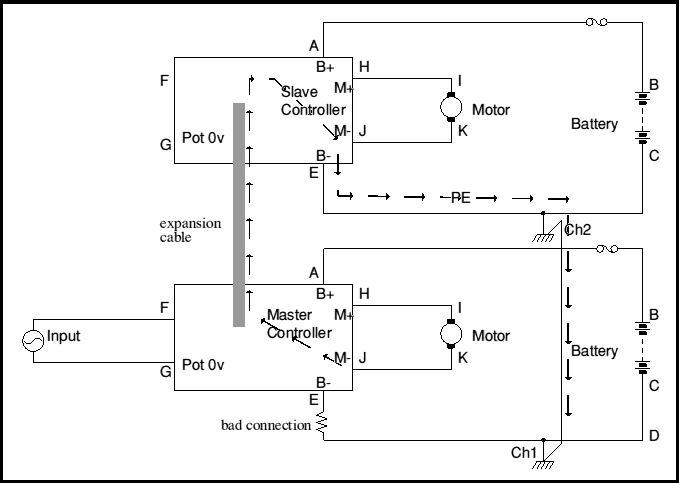 One such path is as shown by the pecked arrowed line, through the internal connections of the master controller, through the 0v connection in the multicore, through the slave controller and so back to battery negative. As well as causing the system not to work, we have seen a case where the expansion connector has melted and the earth track has been severely overheated. Also if this B- connection is intermittently bad it will most likely fail at high battery current when large currents can flow through the double-heading link’e earth which can then fail. Once that has failed components in the slave controller can be blown as well. Consider also the case where the two locos being double headed are separate and coupled together via some sort of coupling. The electrical connection between Ch1 and Ch2 will then be intermittent and unpredictable! Note also the fuses in the batteries. These are especially important with the DNO which uses a MOSFET in the negative battery line as the reverse polarity protection. This MOSFET will itself act as a fuse if current exceeds about 100 amps. Fuses are best chosen to equal motor continuous current rating. 70 amps maximum. The DNO and VTX controllers have undervoltage protection so won’t work (as a single controller) if the battery voltage falls too low. However the undervoltage is detected via the ignition line voltage.When used in double heading the slave’s ignition is worked from the master, hence from its battery. So if the slave controller’s battery fails (or there is a bad connection) – it cannot be detected. If the battery voltage to the slave controller falls too low, the high side (which controls regen braking) switching cannot work properly and the high side MOSFETs overheat so they literally melt and fail. You should therefore either use a common battery for both master and slave or properly connect the battery positive and negative connections so this cannot happen.